Last month people working in the field of addiction, and those in recovery celebrated Join the Voices for Addiction Recovery. National Alcohol and Drug Addiction Recovery Month, or Recovery Month, is an important time in the United States. And it is a perfect opportunity to spread the word: Addiction recovery is possible. If you were one of the many brave men and women who shared their story with world, we at Hope by The Sea commend your bravery. It practically goes without saying, getting up in front of a room of perfect strangers sharing one’s story is not an easy task. Sharing one’s story in a forum as ubiquitous at the Internet in an age still defined by stigma, is a monumental feat. One that says that “you” will not be defined by your mental illness, and you will no longer stand for stigma deterring the afflicted from seeking treatment. Mental illness affects millions of Americans, it is estimated that over 300 million people around the world struggle with depression alone. Only a small percentage of such individuals have ever been treated, many don’t even know that recovery is a possibility. With that in mind, let it be known: Treatment works and you can recover, too. Alcohol and substance use disorder is a debilitating mental health disorder. Many of us did our part last month to shed light on the issue and inspire others to seek treatment and recovery. Yet, the stigma that has long accompanied addiction, has also followed mental illness of any kind. Therefore, it is crucial that we all continue the momentum of September into this month. The first week of October is Mental Illness Awareness Week (MIAW), established by Congress in 1990. Naturally, fighting stigma and educating the public 365 days-a-year is of the utmost importance. Something that the National Alliance on Mental Illness (NAMI) has made their mission. 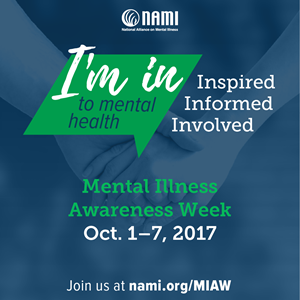 Not only is MIAW about raising mental health awareness, it’s about recognizing all of NAMI’s efforts. On NAMI’s list of conditions, you see Dual Diagnosis. Otherwise known as co-occurring disorders. It extremely common in the field of addiction treatment. Experiencing a substance use disorder and another form of mental illness, like depression, simultaneously. It is an occurrence that affected 7.9 million people in the U.S. in 2014, according to a 2014 National Survey on Drug Use and Health. Addiction experts understand that treating both forms of mental health conditions simultaneously is the best way to accomplish positive outcomes in recovery. At Hope by The Sea, we specialize in the treatment of co-occurring disorders and encourage you to seek help for you or a loved one as soon as possible. The longer such conditions are left untreated, the worse they become. Please contact us today.